Have a burning passion for immortalizing treasured moments with your camera? Your career calling might be being a Photographer. Photographers are creative professionals who capture subjects and scenes to tell a story or record an event. Their photos are masterpieces, often enhancing the appearance of the subjects they capture. Are you a master of the camera? Are you prepared & willing to enter a competitive field? Finally, can you endure mostly unsteady freelance work, at least while you’re first getting started? If the answer is yes to all three, then you have the perfect passion and discipline for a Photography career. While post-secondary education is not a requirement for most photographers, many earn their bachelor’s degree in order to improve their employment prospects. Photographers know that employers seek applicants who can show an understanding of the foundations of photography, so they opt to complete specialized courses. Some specific industries, like photojournalism and scientific photography, often require a bachelor’s degree. Even entry-level positions in these fields require college degrees in photography or a related field. According the U.S. Bureau of Labor Statistics, degrees in biology, medicine, or chemistry could prove useful for scientific photographers, while degrees in business and marketing could benefit aspiring self-employed photographers. Many universities, community colleges, and technical schools offer classes and degrees in photography. These courses cover important information on camera equipment, techniques, and processes. Customers pay photographers to take photographs. They make art by capturing images of people, events, and objects. Through their photos, they try to convey emotion, underlying thoughts, and key pieces of information without the use of words. The equipment they use comprises a camera, different lenses, and lighting devices. They play around with these components to create artistic, high-resolution photographs. While taking pictures is their career, photographers spend more time scheduling shoots, setting up for shoots, maintaining equipment, traveling for jobs, and updating their portfolios. Digital photographers will also spend much of their time using computer software to edit and finalize their images. According to the U.S. Bureau of Labor Statistics, most photographers use digital cameras so they can use computer software to edit photos. The software they use allows them to crop, enhance and adjust the color of photos. Photographers who work for clients will often present their finalized images in digital formats. Photographers who work weddings and provide portrait services are almost always self-employed. In order to get clients, their job description involves advertising and scheduling their own appointments. What Does an Average Day For A Photographer Look Like? Photographers, especially the self-employed kind, will need to market their services in order to gain clients. They do so by updating and sharing their portfolio of pictures, which showcases their best work and the variety of images they can produce. In addition to sharing their work, photographs also respond to job posts, inquiries, and circulate some promotional material. Photographers must constantly interact with people, even before photo shoots. They’ll need to answer their potential clients’ emails, phone calls, and questions. Photographers hope these interactions will lead to booking shoots and making money. During shoots, photographers keep interacting with clients in order to make them feel comfortable in front of the camera. The day of the shoot, be it a portrait day or wedding day, photographers arrive early to set up their equipment. They set up lights, pick appropriate settings or back drops, and direct their subject’s movements. Photographers use various techniques to capture high quality photos and enhance their subject’s appearance. Photographers usually spend the day after the shoot sorting through photographs, picking the best ones, and resizing the images. Digital photographers will upload photos to their computers, where they’ll then use software to edit and enhance photos. Photographers also spend some of their day updating their digital portfolio, often on their own websites. Portfolios are a great way to demonstrate your expertise and draw in new clients. Are You Suited for A Photographer Career? Photographers possess important qualities that make them great at their profession. They are, predictably, creative and artistic individuals. They have a good eye for capturing photos and can assess and manipulate colors, shades, lighting, and shadows. Photographers also have the business skills necessary to interact with clients, get new business, and execute successful marketing strategies. Self-employed photographers know this skill all too well, since their very livelihood is dependent on their ability to sell their services. Photographers must have customer service skills in order to engage clients, understand their needs, and surpass their expectations. Since clients can make or break a photographer’s career, just by posting reviews online, photographers really have to go above and beyond to make their clients happy. They also have to employ their interpersonal skills when interacting with clients and the subjects of their photographs. Being in front of a camera can be nerve-wracking for some individuals. It’s up to the photographer to calm them down and make them feel at home while he/she snaps photographs. Photographers are also incredibly detail-oriented. They take everything into consideration when taking pictures, such as the background, lighting, shadows, and other key elements. When they edit their work, this attention to detail ensures the finished product is as close to perfect as can be. While certifications aren’t required for most photography professions, photographers sometimes still earn bachelor’s degrees in order to have a competitive edge in the job market. Photographers have to be proficient in computer skills. Since they polish their images using photo-editing software, they’ll need to know how to use these technologies. Additionally, since they share their digital portfolios online, they should possess basic website-building and photo-sharing skills. How Does A Photographer Find Work? Apprenticeships can provide aspiring photographers the chance to make connections and network with potential employers. Generic job search sites also offer photographers potential jobs to apply to. In 2016, the U.S. Bureau of Labor Statistics reported that 68% of photographers were self-employed. Many photographers begin their careers as assistants to professional photographers. This allows aspiring self-employed photographers the opportunity to gain experience, network with potential clients, and build their digital portfolios before they start their own businesses. There are several professional affiliations that provide photographers the opportunity to earn attention. The American Photographic Artists, for instance, hosts an annual competition for photographers to submit their photos. Winning the competition will help photographers gain exposure within the industry and will open up new career opportunities. What is the Average Salary of A Photographer? In 2017, the U.S. Bureau of Labor Statistics (BLS) reported that photographers earn a median yearly salary of $32,490. The top 10% in the field earn $75,080, while the bottom 10% earn, on average, $19,400 per year. Salaries can vary by location with California, New York, Florida, Texas, and Illinois being the five top paying states for the job. 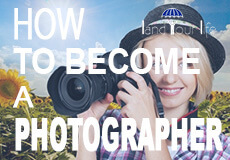 One primary tip is to earn a bachelor’s degree in photography. The BLS reports that bachelor’s degrees and other postsecondary degrees improve a candidate’s employment prospects. Specific top paying jobs, like positions in scientific research, require a bachelor’s degree as well. So in a lot of ways, it would be in the photographer’s best interest to pursue a bachelor’s degree. Another great tip to earn higher salaries is to seek jobs in industries that pay higher wages. BLS reports that photographers who work in: aerospace product and parts manufacturing; medical and diagnostic laboratories; motion picture and video industries; scientific research and development services; and other information services earn annual mean wages ranging from $65,200, to $76,950. The employment of photographers is projected to decline 6% from the year 2016 to 2026, which is slower than the average for other occupants. Since more and more people are buying digital cameras and improvements in digital technology are being made, amateur photographers will begin to enter the workplace with technologically advanced cameras. This will mean that the demand for professional photographers will decrease, and amateur photographers, who charge less, will take some photography jobs. Provide photography services in the professional, scientific, and technical industries. This can involve taking pictures of institutions, animals, and natural elements. Experienced photographers are suited for these positions, especially professionals with a bachelor’s degree in photography. Photographers with degrees that directly align with the job are preferred. For instance, photographers with biology degrees will be suited for photography positions involving mammals. Since photographers will be asked to capture scientific or medical data, microscopes will need to be used. So, professionals in these fields require technical prowess and attention to detail in order to successfully capture intricate scientific and technical subjects. Photographers in these roles can expect to earn an annual mean wage of $38,710. Provide photography services for the radio and television broadcasting industry. This may involve capturing moments with news anchors and radio hosts. Typically, experienced photographers are hired for these roles, especially if they have a bachelor’s degree and broadcasting experience. They can expect to earn an annual mean wage of $49,580. Photograph people, events and places for newspapers, periodicals, books, and director publishers. In these roles, professionals are acting photojournalists, capturing moments that record a pivotal event. Experienced photographers with bachelor’s degrees are suited for the position, especially if they have a journalism background, too. Aspiring photographers in this field can expect to earn an annual mean wage of $47,810. Capture photos for motion picture and video industries. This role can include snapping photos, while on the set of a movie or short video. Experienced photographers are preferred for these positions, especially candidates with bachelor’s degrees. Experience working in motion picture and video industries is a definite plus for employers. Photographers in this field earn an annual mean wage of $65,200.